Today, I have a lovely treat! 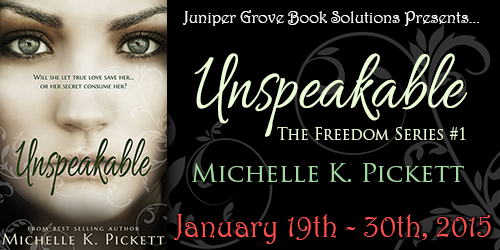 Not only do I have Young Adult Author Michelle K. Pickett talking about the important elements in creating characters who matter to the audience for writers, but she also applies her advice in her new book Unspeakable. So welcome to her book tour. You can visit the tour’s full information at Juniper Grove Book Solutions by clicking this link. Let’s take a look at her amazing new book! Check out the back of this book. 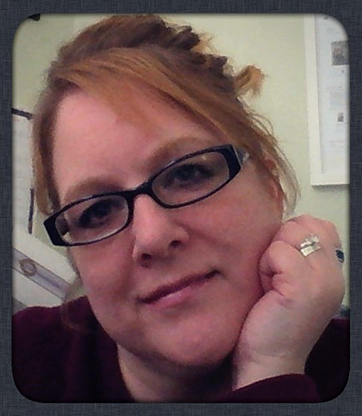 ..Glad to have you here today Michelle! Topic: What advice would you give young writers on how to write characters who matter to the audience? Hi, Erika! Thank you so much for letting me take over your blog today! I’m so excited to be here. You asked about how I write characters who matter to the readers and if I could give any advice to young authors. Well, I am definitely not an expert on the subject, so I’ll just give you a few thoughts on how I develop my characters. Writing characters that resonate with readers is a very hard task for authors. There is a fine line between making the character too perfect and making them “real.” Readers need to relate to, root for, and care about the characters in a book. Even the villain—yeah, that’s a toughie. Personally, I think an author’s characters need to be flawed. All humans are flawed or have some type of secret. Writing a character who is too perfect makes them unbelievable and difficult, if not impossible, to relate to. Even when an author is writing about a zillionaire s/he has to make that person relatable… kind of hard when most readers don’t know what it’s like to have a zillion dollars (or maybe that’s just me. Ha! ), but it can be done by giving that character everyday problems, both emotional and through outside forces. This also relates to the antagonist in the story. S/he needs to have some part of their character that is ultimately good, or at least not all bad. A reason for their actions, is it revenge for a lost love? A vigilante whose childhood was filled with pain and death? A mental illness? Something, even if it’s not a “good” trait, there has to be something in their make-up that a reader can identify with on some level, or at least sympathize with. Yeah, like I mentioned above, this is a very difficult task. Another way an author can make characters real to the readers is giving them quirks. We all have personality quirks. I can’t write if I don’t have my hoodie. Why? I have absolutely no clue. But there it is. In “Unspeakable” Willow has a panache for wearing T-shirts that have sarcastic sayings on them, and things like sequined Converse sneakers. A new adult contemporary romance I’m working on has a main character who has an interest in different types of phobias people have (no, he isn’t a psychologist or in that field). When a character in the book doesn’t want to do something, or makes excuses to avoid certain situations, he points out what phobia they may suffer from. This sounds like a serious part of the book, but it’s actually a silly quirk designed to give the character a likeable, humorous demeanor. These flaws and quirks will hopefully make an author’s characters memorable, and that’s what we strive for. Without characters that readers like, the book is a failure regardless if the story is outstanding. Perhaps the most important part of developing a character who is memorable, is giving them a profound life situation, a social, emotional, or physical situation to work through. Something they have to fight. Readers want a character who has an obstacle to overcome. They want to see the “real” problems in the character’s life so they can root for them. These are the things I try to remember while developing my characters. But if you really want to know, I have very little to do with the process. It sounds a little crazy (or a lot), but my characters usually come to me. When a story idea presents itself, it’s usually the characters who direct me. They take me where they want to go, they show me their personalities, and I fall in love with them. And hope readers do as well. Thank you again for having me. I enjoyed sharing my thoughts on characters. I hope everyone will take a peek at “Unspeakable” and my upcoming paranormal romance, “Milayna,” and see if I was successful in making the characters likeable and memorable. Drop me an email. I’d love to chat with you! Gifts include: A bookmark swag pack, winner’s choice of any Clean Teen Publishing eBook, and a $15 Amazon gift card. The Giveaway is International. Use this imbedded link to enter the raffle. Posted on January 23, 2015, in Uncategorized. Bookmark the permalink. 1 Comment.